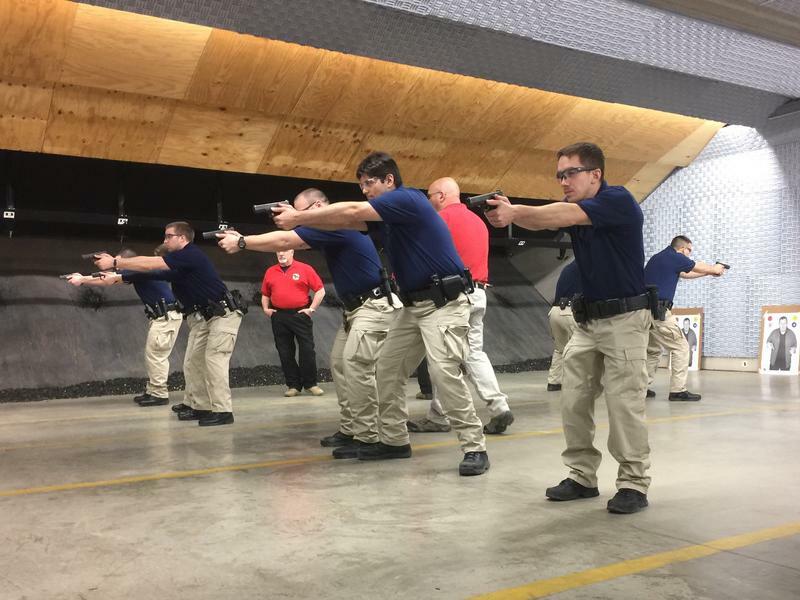 Local, county, and state officers participate in Law Enforcement Training. 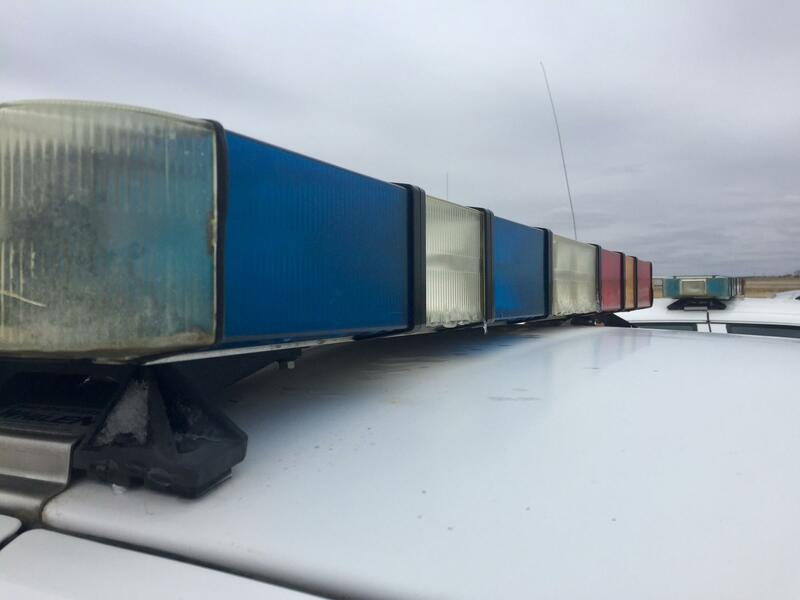 More state and local law enforcement authorities are talking about their feelings. It’s happening in part through a course on emotional intelligence. 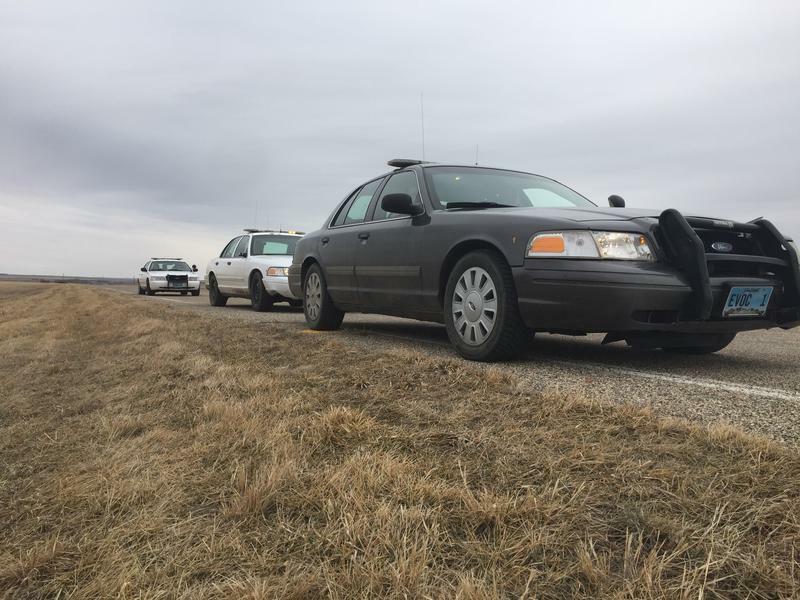 The State of South Dakota mandates it during training for city police, county officers, and state troopers. SDPB's Kealey Bultena reports on emotional intelligence in SD law enforcement training. Following that, listen as In The Moment host Lori Walsh talks with SD Division of Criminal Investigation Director Bryan Gortmaker. Almost nothing is visible in the blackness when a trainer’s voice echoes through the dark. He instructs recruits to use a light technique of their choice. He gives the command, and recruits pull their guns and prepare to shoot. Circles of light illuminate silhouettes. The beams overlap like Venn diagrams as students employ flashlights during a weapons simulation. Strobes of light swirl as law enforcement recruits complete the drill. More clicks ring into the room before students slide their firearms into their belts. Welcome to law enforcement training in Pierre, South Dakota. Recruits don navy polos, khaki pants, and black shoes. They sport belts with compartments to carry the tools of their profession. 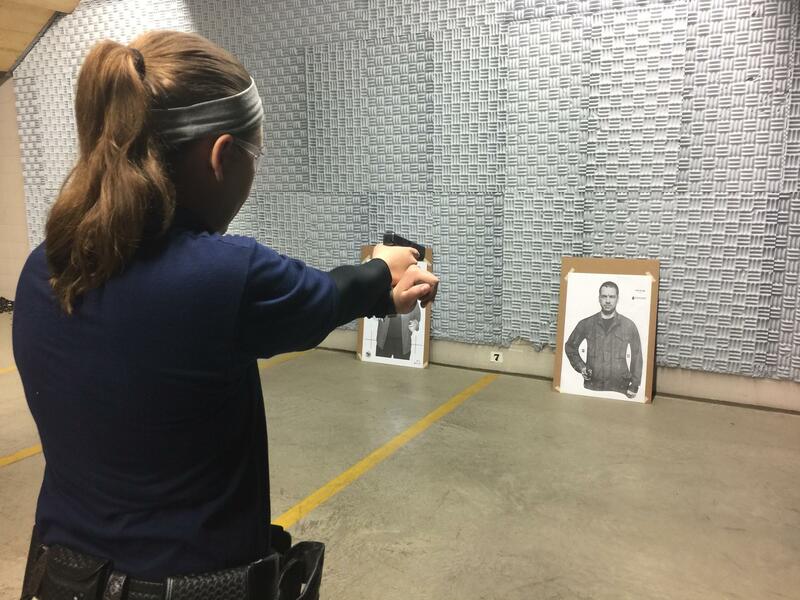 They work with firearms, learn defensive tactics, and journal about their emotions. "It’s fun to watch some of them, because, of all the materials they have, they have two books on emotional intelligence sitting there on top. You see some of them just from the body language like, ‘What in the world is this? I thought we were coming to police academy,'" law enforcement training coordinator Greg Williams says. Emotional intelligence training is a requirement in South Dakota’s program. Williams says it starts by helping recruits know what they don’t know. Williams mentors Andrew Becker. He is a police officer from Mitchell. Becker completes an emotional intelligence survey to assess four competencies. His weakest area is self-awareness. "I don’t know what I’ll find out about myself in the next ten weeks that I either have been ignoring or just not recognized and now I’m focused on it," Becker says. 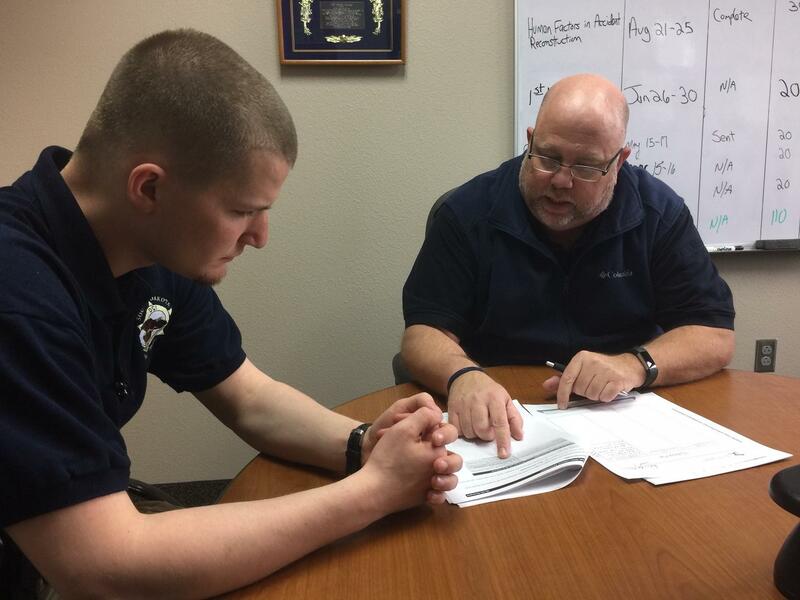 Mitchell Police officer Andrew Becker talks with Law Enforcement Training Coordinator Greg Williams. Becker says he’s willing to learn. He and Williams develop a plan to pay attention to situations that elicit emotion, and Becker commits to journaling about his responses – both the way he reacts and how he can improve. Williams says self-awareness requires people take responsibility for their feelings. "He may think he is handling something effectively, and really he is not," Williams says. "That’s why I recommend he talk to his girlfriend or to his parents, and you start realizing pretty quickly that you’re not reacting the way you think you could be reacting." Williams says recruits need practice recognizing their own emotions and understanding how they affect other people. "When they get into live fire, they will have to journal about, okay, today you shot somebody. Okay, now you have to go home and have a conversation with your family about that," Williams says. "How’s that conversation going to be? It’s adding that whole aspect, so they’re forced to confront the emotions of, ‘Okay, I just shot somebody today.” Now granted, it’s fictitious here, but it gets them think about, ‘How am I going to handle this? What am I going to tell my kids – if anything? How am I going to explain this to my wife?’"
Williams rattles off statistics that indicate law enforcement officers experience greater-than-average rates of burn out, relationship problems, and even suicide. "Think about the oxygen mask in the plane. You put it on yourself first before you can treat others," Williams says. "Well, if we can’t teach a police officer that same aspect, how in the world can they serve the public if they can’t serve themselves first?" Serving themselves first does not mean putting themselves first. Recruit Eric Peterson knows that. Peterson embodies a classic image of law enforcement: pressed creases on his clothes, shiny shoes, close-cropped hair, and a demeanor that is so overly professional it’s difficult to read. "Think about the oxygen mask in the plane. You put it on yourself first before you can treat others." Peterson says he and his wife recently sold their home. He’s training a couple of hours away, so his wife had to take on the for-sale-by-owner work in addition to everyday life that includes a four-year-old and pets. Peterson says his wife wanted to enlist a realtor. "I just didn’t want to pay the money for it, so it was kind of that weighing the cost of paying the money to have a realtor to take the burden off my wife and sell it quicker, or kind of be stubborn and me not wanting to spend the money and holding onto that," Peterson says. "So, instead of maybe being quick to say, ‘Hey, no we’re not going to spend the money. Let’s wait,’ that was kind of my action to think about how that would affect her and ripple out not only to my son but to all those that surrounded my wife, so it was just a better option to go with the realtor to help her down the process, which would help everybody else around her also." Peterson says his focus on self-awareness helps him acknowledge how he hurts or uplifts people he encounters. Peterson completed the state law enforcement training before entering the Highway Patrol academy. The future state trooper says he didn’t anticipate an emotional intelligence component, but he says it makes sense. "If it’s just a speeding ticket or something like that, we can make a positive outcome so that, if we do end it that way, the next officer that maybe stops somebody or that they see at a convenience store and say hi to, it’ll be a positive impact for them," Peterson says. "So then we’re building the better image of police in today’s world instead of already trying to dig out of a hole." Law enforcement training includes simulating traffic stops. 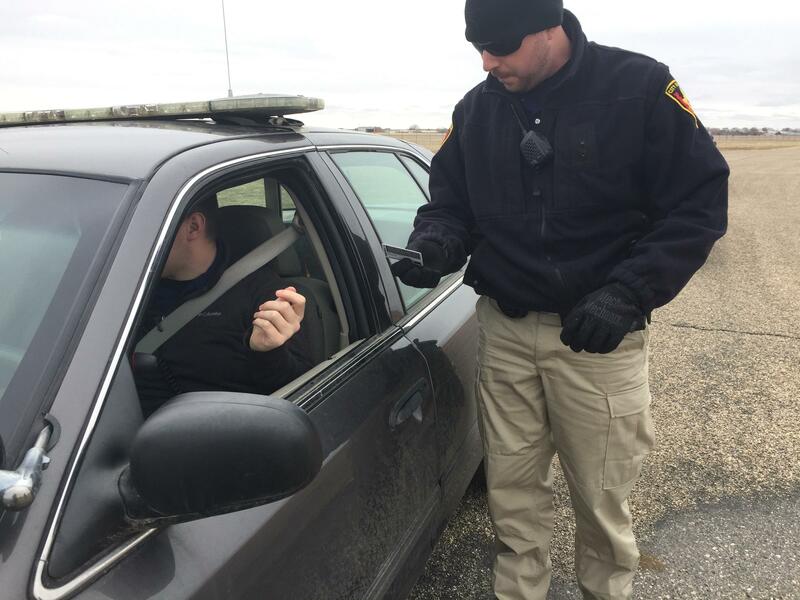 South Dakota law enforcement students on a range of twisting roads simulate traffic stops. They use the right radio calls, park correctly behind the vehicles they pull over, and walk up to the windows to practice the procedure. Highway Patrol recruit Jordan Melius says she sees value in using a person’s name here. "It’s saying, ‘I’m not a robot. I actually want to know a little bit about you, and you are a person. You’re a human being to me, and I respect that,'" Melius says. Melius has dark hair slicked back into a short ponytail. Her black tie is straight, and her badge gleams. Melius characterizes herself as shy, and this former accountant says she’s working on her social awareness. She says she’s great with faces but struggles with names. She set a goal to learn more than 50 names for everyone in her training class and instructors. She did it by week two. "When somebody that you know comes up and remembers your name, you feel a sense of, ‘Hey that person actually cares about me.’ That’s why it’s attached to the emotional intelligence," Melius says. "It’s not just the person who’s reaching those goals, hey I can do this. It’s making every else feel important." Melius says her emotional intelligence survey shows she has keen self-awareness, but she says she struggled with her confidence. 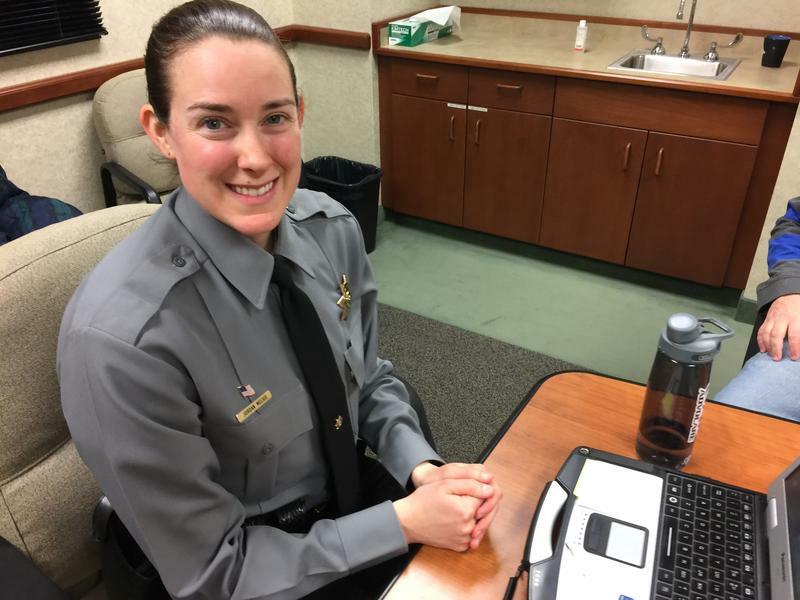 Melius says she turned to other strategies in South Dakota’s law enforcement curriculum to bolster her strength. She visualized herself succeeding. SDHP recruits stand ahead of lunch. Jordan Melius is second in line. "And I couldn’t believe how much it actually worked before I went and did a class – say firearms. I said, ‘Okay. I’m going to visualize myself. I’m going to go ahead and go through the qualifications course.’ And what wonders it did. During my second qualifications course, I got a passing score when I thought I would struggle even more," Melius says. Visualizing success doesn’t work for everyone. That’s why mentors work with students to select the right strategies to build their emotional intelligence. 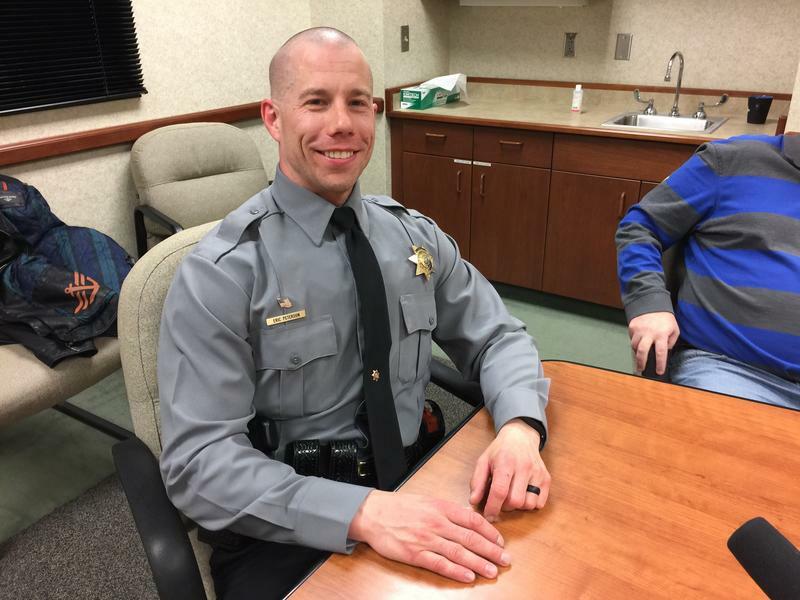 Mitchell police officer Andrew Becker is just beginning his journey, but he says he’s buying it. 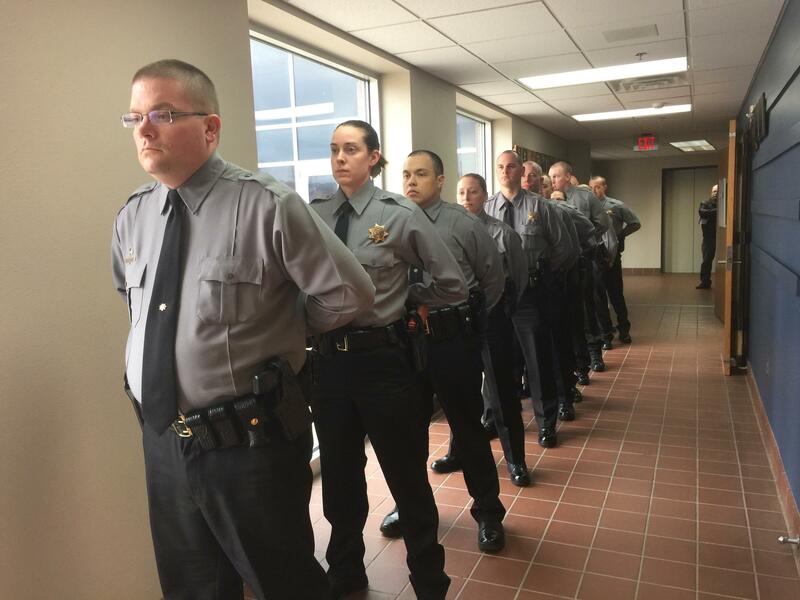 "As far as an agency sense, as far as a state sense and a training sense, I feel this is one step toward being overall more healthy, law enforcement officers that are more in touch with their emotions, able to understand what’s going on in their life both personally and in their career field," Becker says. Trainers say that’s the goal: arming students with techniques to take them through decades of service.